Rachel Garcia will try to make it back-to-back National Player of the Year honors. Photo: UCLA Softball. 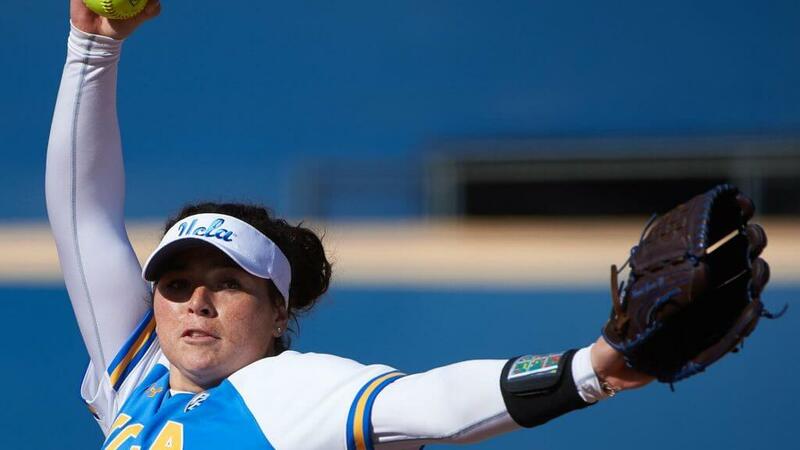 With the 2019 NCAA Softball season just over a week away, USA Softball has unveiled the Top 50 Watch List for the 2019 USA Softball Collegiate Player of the Year. Highlighting the Watch List are two previous USA Softball Player of the Year recipients and three NCAA National Champions. The USA Softball Collegiate Player of the Year award, which is entering its 18th season, recognizes outstanding athletic achievement by Division I female collegiate softball players across the country. The Watch List includes 24 seniors, 16 juniors and 10 sophomores, with freshman ineligible for consideration. (Freshman can be considered for the USA Softball Collegiate Player of the Year award once they have competed at the collegiate level). Athletes named to the Watch List represent 36 NCAA Division I universities and 15 athletic conferences. 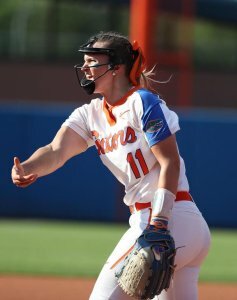 Florida standout pitcher Kelly Barnhill was the 2017 National Player of the Year and is one of three Gators on the preseason list. Photo: Tim Casey/FloridaGators.com. Among the universities, Arizona and Washington have four athlete representatives apiece, while Florida, Oklahoma and UCLA have three athletes on the Watch List. The Southeastern Conference (SEC) is also well represented with 13 athletes, while 12 Pac-12 Conference athletes are on the Watch List. The Top 25 Finalists for the 2019 USA Softball Collegiate Player of the Year award will be announced April 24. 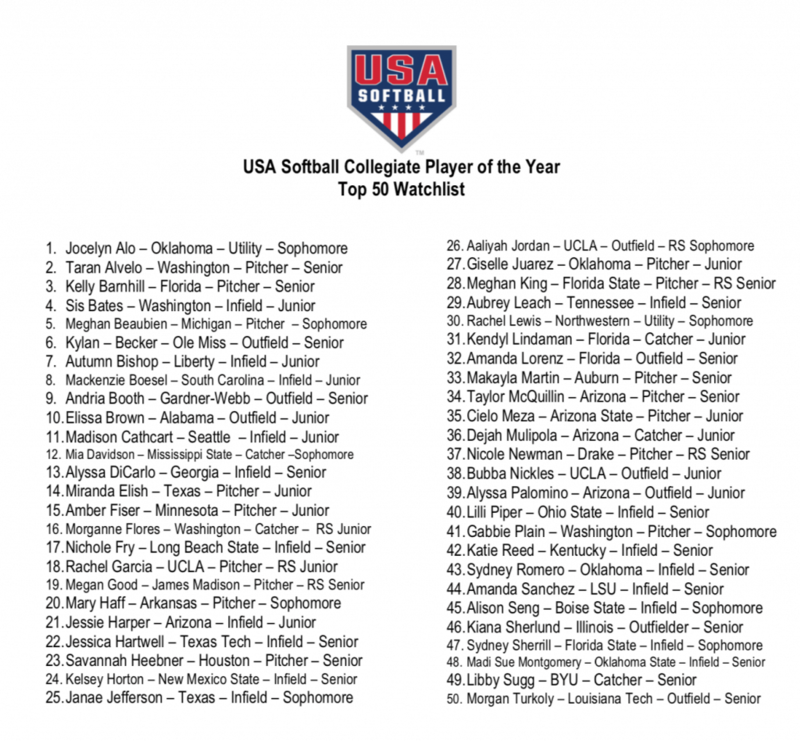 While an athlete does not have to be on the Watch List to be considered for the Top 25, the eventual USA Softball Collegiate Player of the Year will come from the Top 25 Finalists. The Top 10 Finalists will be announced May 8 and the Top 3 announced May 22. The 2019 USA Softball Collegiate Player of the Year will be revealed May 28. In addition to bestowing the USA Softball Collegiate Player of the Year award, USA Softball is now in its 17th season of presenting the ESPN.com/USA Softball Collegiate Top 25 Poll and the USA Softball Collegiate Player of the Week, which are announced Tuesdays during the regular season. The preseason ESPN.com/USA Softball Collegiate Top 25 Poll was released Jan. 29 with UCLA, Washington, Florida State, Oklahoma and Florida taking the Top 5 spots respectively.